In a thrilling adaptation of Edgar Allan Poe’s best-known works, acclaimed artist-adapter Gareth Hinds translates Poe's dark genius into graphic-novel format. Hinds adds to his impressive ­library of graphic novel adaptations with this collection of stories and poems...A spellbinding adaptation of one of America’s most legendary authors. This volume can easily be worked into literature courses and is a fantastic way to introduce Poe to new readers. Graphic-novel veteran Hinds turns his astute eye to Poe's best-known tales....Also included are historical notes about Poe and each vignette, making this volume equally valuable for classroom use or for independent reading. Befittingly dark, atmospheric, and evocative. Faithfully preserving the gothic tone of the original texts, from the macabre endpapers filled with symbols of death to the twisted anguished faces found throughout its pages, the author never shies away from the darkness found there, instead distilling Poe’s fascination with madness, death, and terror into single haunting images...A welcome addition for fans of graphic horror. In a neat detail, each story opens with a legend indicating recurring themes (death, fire, and scary sounds in “The Bells”) so readers know what to expect; Hinds further reflects on and contextualizes each story in endnotes. Hinds doesn’t sugarcoat the blood and gore in these stories and poems—each haunting sequence is rife with tension and dread. As always, Hinds’s adaptations lean heavily on the original language of the text with an eye toward accessibility for the modern reader and an understanding that the illustrations will carry a good portion of the narrative. Hinds’s varied illustrations are a good match for Poe’s atmospheric blend of horror and mystery. 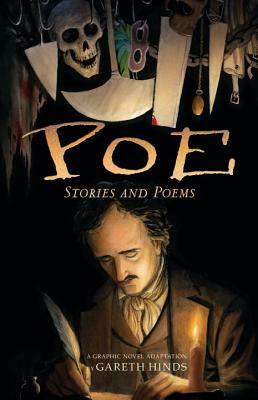 This book makes a great introduction to Poe’s work, and will be a great addition to any school library’s graphic novel section. Brilliant and terrifying, this collection shows in pictures much of what Poe revealed only through words.